First, you are going to start by lighting some Cowboy Charcoal to make a campfire to cook the Campfire Breakfast Skillet. Next, you will cook all of your favorite veggies & meat inside the skillet until they are nice and brown. The key to browning food in cast iron is butter. We call for 3 tbsp of butter, but don’t be afraid to add more for a larger skillet. Throw some eggs on top and you’re in for a great morning! Making eggs over the fire should be a lot easier than you think! Truth is that this Campfire Breakfast Skillet has all the necessary ingredients to make something delicious, but a few pointers might help to make everything even better. One thing to be aware of is that you must cook your meat first. This will help coat the skillet with something that will not stick: grease. 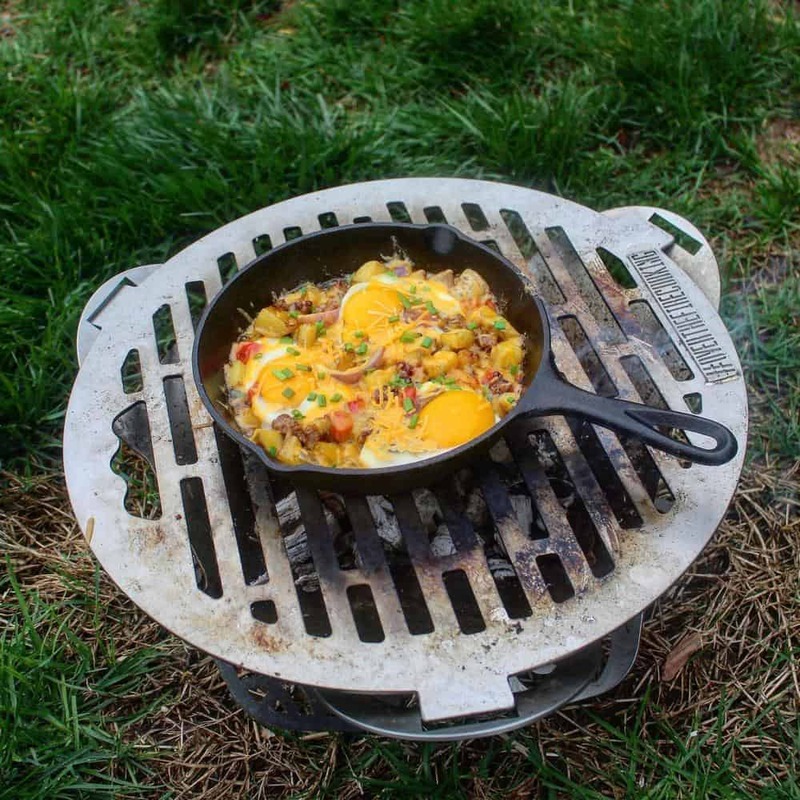 Next, you need to have a quality cast iron skillet for the Campfire Breakfast Skillet! I highly recommend using a skillet that is NOT new. This means that it has a few cooks underneath its belt and has built up a few layers of seasoning. If you need to use a new skillet they check out my tips for making it seasoned! Finally, try adding a cover to the top of the skillet if you do not want your eggs runny. This will help everything be cooked from the top and bottom of the Campfire Breakfast Skillet. 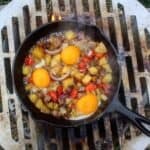 Eggs, peppers, onions and more all cooked in one skillet over the fire! Use some Cowboy Hardwood Lump Charcoal to light fire and let burn for 10-15 minutes. Once charcoal is white hot, push into middle for direct grilling. Preheat skillet 2-3 minutes for cooking. Add country sausage to skillet and let brown. Once sausage is browned, add chopped golden potatoes, onions & 2 tbsp of butter to cook for 8 minutes. Stir occasionally. Add chopped red onion to the skillet and cook for another 2 minutes. As everything browns and cooks, add the last tbsp of butter and let it sizzle into skillet. Prep skillet for eggs by flattening ingredients inside. Add eggs to the top of the skillet and let cook for 5 minutes. (Optional): Add a cover to your skillet if you do not like eggs sunny side up! Top the skillet with cheese & chives and let melt. Equipment Needed: Cowboy Charcoal, cast iron skillet, spatula, knife, and a cutting board.